I’ve learned something new that I need to share with you. It’s about grilling chicken pieces. You know how it always smells so good, but only the outer part that hits the marinade/rub/glaze is the only part that tastes the way it smells. And that it’s usually always just the skin, which when you get to be my age, you need to avoid that added fatty deliciousness at all costs! Then you’re left with meat, plain meat, just meat. No rub, no marinade, no burnt on glaze. It’s enough to make you cry. Well I’m here to tell you, my friends, that Steven Raichlen has done it again. He’s shown me the light and I intend to never grill my whole chicken or chicken pieces any other way again! SLASH your meat, then work that rub/marinade/sauce in between every nook and cranny. Grill as usual. Another great thing about this, is your grilling time is cut considerably. It may look a little funny, but once you finish off a piece of chicken that was delicious to the very last bite, you’ll never go back. Remember the more you slash, the more flavor, but don’t get so carried away that your meat is falling off the bone before it even hits the grill. Who’da thunk!!! Genius! I’m trying it tonight! The chicken is already thawing!! Actually, I think it looks really cool. At first I thought you’d wrapped it in bacon. I like the look of that a LOT. Thanks for passing the idea along. I never would have thought about slashing the chicken. I actually think it looks kind of interesting. Such a great idea! I have several Steven Raichlen books. This looks so much easier. Jamie Oliver also slashes the meat when he grills. I’ve noticed that. I will try it next time I hit the grill (I am the griller in the family. My husband has no patience for it at all). This looks very good. 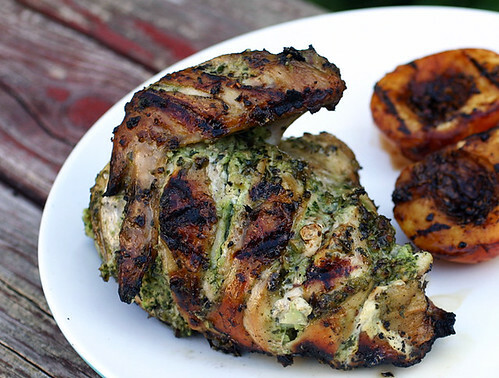 i love your idea….i would also love the recipe you used for your marinade…looks awesome. Thank you Diane! 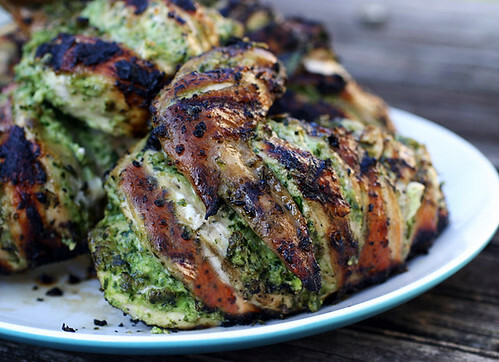 I believe I rubbed pesto on that chicken.